KWalletManager manages some of your passwords in an encrypted file - but Kgpg does not use Kwallet, neither does firefox. KWalletManager is an optional tool which can greatly assist your work-flow while maintaining security. You control which applications may use the wallet - everything else will have to ask you for a password. Clicking (or in some versions, double-clicking) on a wallet allows you to examine the contents of a wallet. From here you can remove any entries that you do not wish to be further controlled by the wallet. A further advantage is that it is possible to examine the passwords for individual entries - particularly useful if you have mis-typed a password and stored it. These activities remain secure, since they are only available after you have given the passphrase. For greater security configure KWalletManager to use one wallet for local passwords and a separate one for network passwords and form data. Some apps, e.g. octopi, offer multiple options for password entry, e.g. gksu besides kdesu. gksu then offers to store a password, say the root password, in the gnome-keyring to save you the bother of repeated entering of the password in short intervals of time. That gnome keyring is a "wallet" separate from the KDE-wallet. Another separate "wallet" is the file /etc/passwd for login passwords into Gnu/Linux. Open KDE Wallet Manager, and go to Settings -> Configure Wallet... -> Access Control, and there adjust application settings. 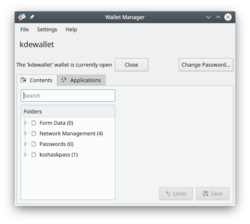 Useful if you mistakenly told an application not to use KDE Wallet Manager. Use KDE-wallet with Python in a CLI: CLI. This page was last modified on 6 August 2018, at 15:23. Content is available under Creative Commons License SA 4.0 unless otherwise noted.